Home > Google News > Google AdSense > iAds Drops Prices Increases Revenue Share: But Does It Compare To AdMob or Google AdSense? 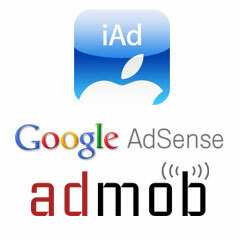 iAds Drops Prices Increases Revenue Share: But Does It Compare To AdMob or Google AdSense? Some of you may know that my company is pretty heavy into iPhone development and Android development - but we also have some very popular apps that we sell or give away in the various markets. We have tons of Jewish iPhone apps (and some non Jewish iPhone apps) and also some Android apps. Many of our apps are free, and some of the free apps are monetized with ad networks. I've been testing some of the larger ad networks for a long time now, including Google AdSense for Mobile Apps, AdMob (which has now taken over for AdSense since Google acquired them) and Apple iAds. So when I heard Apple dropped the price for advertisers to participate in iAds, I was happy. The volume is not there and the earnings are not there also. Previously, Apple required a minimum ad spend of half a million dollars, Apple dropped that to only $100,000, which is still huge compared to virtually no requirement with Google's AdMob. So I am hoping this is a step in the right direction for Apple and iAds - I'd love to see it more self service and thus yield more ad inventory and hopefully a higher eCPM. Since we have started with ads in our apps, we used both iAds and Google ads. A few weeks ago, our Google AdSense ads stopped working completely. Google AdSense was paying us well, a eCPM of about $2.50. It was out performing Apple iAds at about $0.70 eCPM and doing much better than my tests with AdMob earning under $0.40 eCPM. The issue is, now AdSense is not an option and our earnings have dropped. In any event, Apple said they have increased the revenue share to 70 percent, which is just about what Google AdSense gives, a little higher actually. Do you monetize your apps with ads? What works for you? Please no spam.